After West Bengal and Karnataka, the 'Centre versus state' tussle reached Madhya Pradesh on Sunday with Income Tax sleuths launching pre-dawn searches on at least 50 locations in Delhi, Indore and Bhopal against people linked to Chief Minister Kamal Nath on charges of alleged tax evasion. The I-T department on Sunday morning began searching the offices and residential premises of Nath’s Officer on Special Duty, Praveen Kakkar, former advisor RK Miglani and executives linked to his brother-in-law Deepak Puri’s firm Moser Baer. According to reports the searches are said to have been carried out after information was received of suspicious cash holdings. A state of conflict: The drama escalated in the evening with state police arriving at the Praveen Kakkar’s residence. The police officers wanted entry into the restricted area claiming that they have been receiving complaints from the residents of the complex that their movement was being restricted by the CRPF personnel. A CRPF official, alleged that the Madhya Pradesh Police wasn't letting them work and “hurling abuses” at them. Meanwhile, the police said that they were only doing their jobs and tending to the people inside the residential complex. Meanwhile, hours after the raids, the Election Commission instructed various agencies to ensure that their pre-poll raids remain politically neutral. “The Election Commission strongly advises that all enforcement actions during the election period, even when conducted ruthlessly with a view to curb the blatant electoral malpractice (of using money power to influence voter behaviour), be absolutely neutral, impartial and non-discriminatory,” a letter issued by the poll body read. 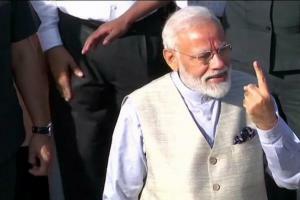 The ruling BJP is likely to release its manifesto titled “Sankalp Patra” for the upcoming Lok Sabha election Top party leaders, including Prime Minister Narendra Modi and its chief Amit Shah, will be present at the launch of the manifesto. With the Congress manifesto putting major thrust on welfare measures, including a promise of giving Rs 72,000 to the poorest 20 per cent households in India, the ruling party is likely to make a slew of promises to woo different sections of the society, especially farmers, youth and women, besides the other marginalised sections. The Congress on Sunday also launched its Election tagline – ‘Ab Hoga Nyay’, which refers to the minimum income guarantee scheme. The opposition grand alliance in Uttar Pradesh comprising Bahujan Samaj Party(BSP), Samajwadi Party(SP) and Rashtriya Lok Dal(RLD) held its first joint rally on Sunday. The rally was addressed by BSP supremo Mayawati, SP chief Akhilesh Yadav and RLD president Ajit Singh. In her rally address, Mayawati hit out at Congress. “If we form a government, we will not just give Rs 6,000 but also provide stable employment to every household," Mayawati, said in her tirade against Congress' Nyay scheme. Meanwhile, alliance partner Samajwadi Party chief Akhilesh Yadav slammed the BJP and said, “They [BJP] call us milawati gathbandhan...they are drunk on power. This gathbandhan is not milawat, this is for mahaparivartan. This is gathbandhan for electing a new prime minister." The rally was attended by lakhs of loyalists, including the party’s tradition supporters- the Jats, Yadavs and Muslims. Many among them were recent graduates and farmers who expressed anger over the lack of jobs and sugarcane dues. Both Mayawati and Akhilesh Yadav spoke on these issues in their speeches. "Farmers here sow sugarcane and sweeten the entire nation. But BJP doesn't care about you. Mayawati ji acted against mill owners, we acted against mill owners. But the BJP has done nothing," Akhilesh Yadav said. Read Suhas Munshi’s ground report here. 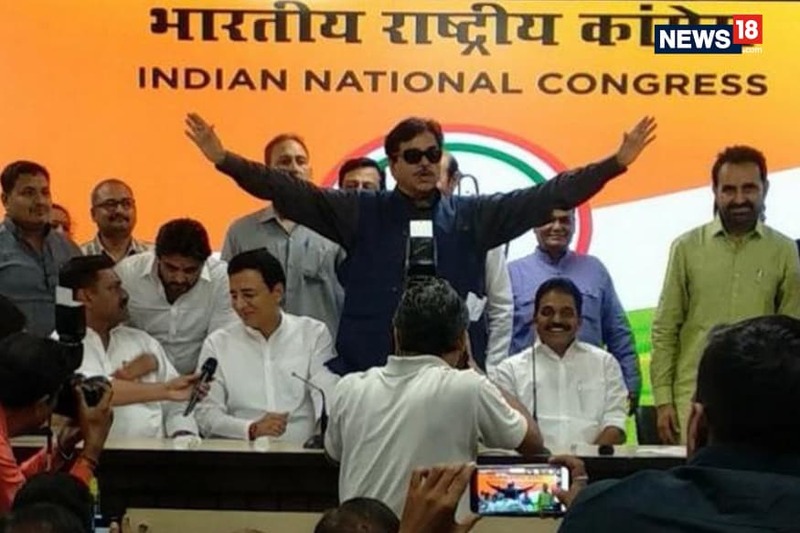 Actor-turned politician Shatrughan Sinha on Satuday joined the Congress, ending days of suspense over his association with the grand old party. At the press conference, which was attended by Congress spokesperson Randeep Surjewala, Sinha launched a scathing attack on the BJP saying there was no concept of collective decision in the saffron party and that he was disowned by the party because of his association with BJP veteran LK Advani, who was recently ruled out of the poll fray. “The BJP is a one-man show, two-man army,” Sinha said at the press conference, adding that the BJP must learn from its critics, instead of sidelining them. The Congress on Sunday said it was not in talks with the AAP or any other party for alliance in Haryana and Punjab, and will soon declare its candidates for the two states. According to Congress chief spokesperson Randeep Surjewala “the party is yet to reach a decision on forging an alliance with the AAP in Delhi.” The party's assertion came a day after an AAP leader said the Arvind Kejriwal-led party will firm up an alliance with the Congress in Delhi only if the two parties fight the Lok Sabha polls jointly in Haryana and Chandigarh too. Fourteen days after replacing Union minister SS Ahluwalia with Raju Singh Bista in the Darjeeling Lok Sabha constituency, the BJP on Sunday sprung a surprise by fielding Ahluwalia from the Burdwan-Durgapur parliamentary seat in West Bengal. “I'm grateful to Waheguru & thankful to the Party, Shri Narendra Modiji & Shri Amit Shahji for reposing faith in me yet again & nominating me to contest Lok Sabha from Bardhaman-Durgapur,” Ahluwalia said. The party had earlier sparked a controversy after it had decided to nominate Raju Singh Bista, who is backed by the Gorkha National Liberation Front (GNLF) and the Bimal Gurung faction of Gorkha Janmukti Morcha (GJM), from the Darjeeling seat. India on Sunday rejected as "irresponsible and preposterous" Pakistan Foreign Minister Shah Mahmood Qureshi's comments that India was planning to attack Pakistan again between April 16 and 20. "India rejects the irresponsible and preposterous statement by the foreign minister of Pakistan with a clear objective of whipping up war hysteria in the region. This public gimmick appears to be a call to Pakistan-based terrorists to undertake a terror attack in India," Raveesh Kumar said in a statement. The MEA spokesperson's statement came hours after Qureshi said in a press conference in Multan that Pakistan has "reliable intelligence" that India is planning to attack Pakistan again between April 16 and 20. Aurangabad, popularly known as the Chittorgarh of Bihar, is all set to witness a direct contest between the forward and backward castes with the Grand Alliance pitting Upendra Prasad of the HAM (Secular) against sitting MP Sushil Kumar Singh of the BJP. 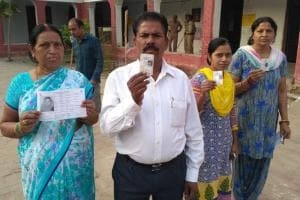 While BJP candidate Singh, the son of former MP Ramnaresh Singh alias Lootan Singh, is banking on the saffron party’s vote bank – Rajput, Bhumihar, Brahmin – HAM (S) candidate Prasad, a former MLC, is expecting votes from Koeris, Yadavs, Muslims, Paswans and Musahars in the scheduled caste category. After Rajputs, Musahars and Yadavs are in sizeable numbers in the constituency. Rounak Kumar Gunjan finds out how the battle for the Aurangabad seat is likely to pan out. When the Election Commission announced the dates last month for the upcoming Lok Sabha elections, few people were surprised that polling in Uttar Pradesh would be spread over all seven phases. The state, due to its size, has witnessed elections in multiple phases in the past — even the 2017 state elections were held in seven phases. What this meant was that UP, with its complex caste dynamics, was set to remain in the headlines for the entire duration of elections. With every passing phase of election, a specific region will be going to the ballot — each with its own caste, political, and social matrices which will play a major role in the outcome of these elections. In this piece, Fazil Khan and Ashwatejh Purushothaman analyse how Awadh votes. With his new film titled Romeo Akbar Walter (RAW), John Abraham has proved his mettle. The film, directed by Robbie Grewal, has flaws but manages to keep the audience engaged with its fast tempo. News18.com's Rohit Vats reviews the film.